Local Animal Links: Animal Resource Center Local Animal Links Talk About It S.A. Feral Cat Coalition S.N.A.P. Jill, our library CATaloger, spotted this cutie in a tall tree on campus; we baited a trap nearby, and soon Coconut was neutered and vaccinated. 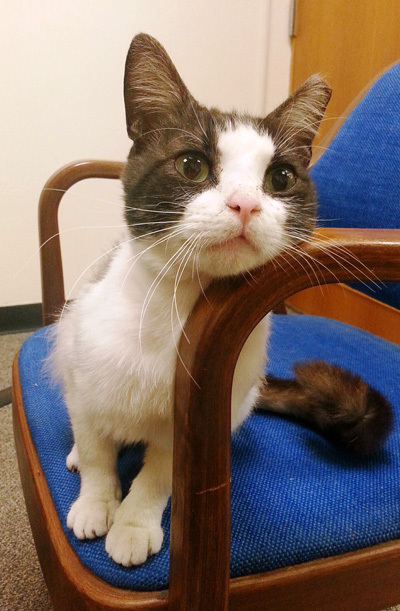 Seven-month old Coconut is an eager eater, is litterbox proficient, and loves human attention. And look at his fur and those whiskers—magnificent! Jill has graciously offered to foster him while we locate a forever home. Interested? Email Caroline Byrd or Nettie Lucio or call us at 436-3430.